Yesterday I had my 37-week check for Charlie. My BP was quite high 170/98, then 165/94, so there was concern that I was going back into the pre-eclampsia risk zone I hit at the end of my pregnancy with Jack. She did an internal check and I have not dilated. So at this point the concern is more with me vs. Charlie. They did some blood work and a non-stress test to check us both out. 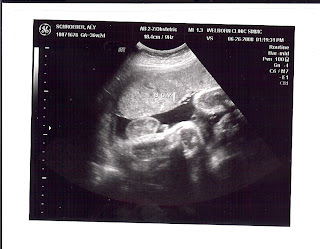 The non-stress test is basically the mom sitting still w/ two monitors on her belly. One measures any contractions that may occur, the other reads the fetal heartbeat. I also had a clicker in my hand and had to note each time he moved. For some reason, they were having a hard time monitoring Charlie's heartbeat on the machine, so they ordered a bio-levels check. I had no idea what this meant, but it turns out it's another ultrasound. Amazing how exciting and scary that ultrasound room can be! At 20 weeks pregnant I was dying to be in there. But when you're taken in with a touch of a hurried staff around you, it's less than thrilling. While nerve-wrecking at first, it was neat to see the little guy!! As soon as I saw him move, I knew he was ok and that the issue must have been with the other machine they were using to check his heart. The u/s tech agreed and took a ton of measurements. Charlie checked out just fine and is growing like a champ. They estimated him to be around 5lbs, 13 oz right now. He is head down and doing everything a 37 week old babe should do. I have an appt. first thing Tuesday morning to check on things again. They took my BP right before I left and it had gone down some, which is good. While being there for 2.5 hours was not on my agenda, it's good to know (& see) how well Charlie is doing! I feel like I can control my body a bit more, so if his is doing ok, I can take the actions I need to ensure mine is fine too. 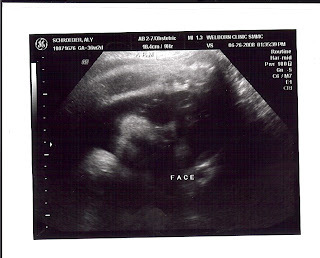 Here are the pictures of Charlie from the ultrasound. They are a bit hard to see in part b/c he is so cramped in there. The first one is the most clear. 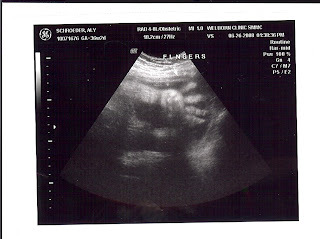 At the top of the picture is his little hand, draped over his forehead. See the little turtle-like shape resting on his leg? yep! definitely still a boy!! This is the one that took me a few times to actually *see*. It's a shot of his face. His actual face takes up most of the middle of the pic, and he is looking right at you. He has one arm fully draped across his forehead, and his mouth is slightly open. His eyes and mouth are just kinda dark shadows. His mouth is above and to the left of the word FACE on the picture. In all of the craziness of these past few months, it's been easy to brush aside the excitement of meeting Charlie. But yesterday I had 30 solid minutes of just watching my youngest son move, stretch, yawn and hiccup. I saw all of his little features and fell in love with each one as they passed by the black and white screen. So even though it was a crazy morning, in the end I couldn't have asked for a better gift. So glad that everything turned out OK! Please take it easy and rest. Let Charlie "bake" a bit more. Wow- hard to believe he's almost here! I'm relieved everything is okay for the both of you. Terribly frightning, I'm sure, but Mr. Charlie has one heck of a momma protecting him so he's going to be just fine! I wonder what Charlie will be like when he arrives. So far, he's sure seeming to have the ability to roll with the punches! I'm so glad the fear of your visit wasn't related to a true emergency, and that you and he will be one for a while longer. On the other hand, I'll be heading the line to take him off your hands when you need a break, once he's arrived and you're all living close by.